This former slave clock was made by Pragotron in Prague, at that time the capital of Czechoslovakia. 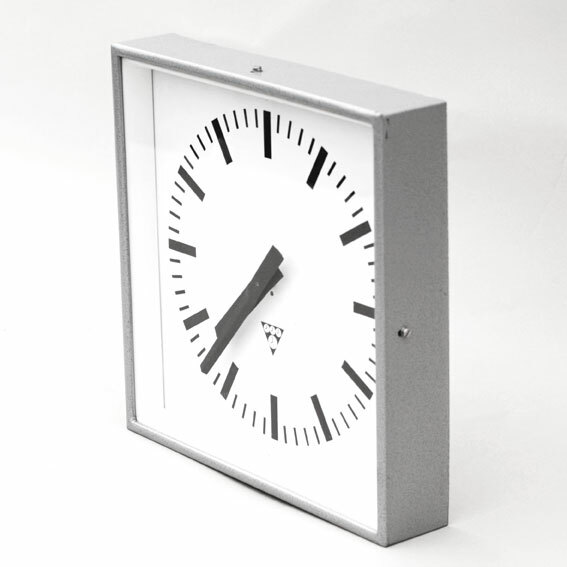 The design is based on Hans Hilfiker’s acclaimed, clearly structured 1944 design for the clocks installed at railway stations in Switzerland with truncated hands and no digits. 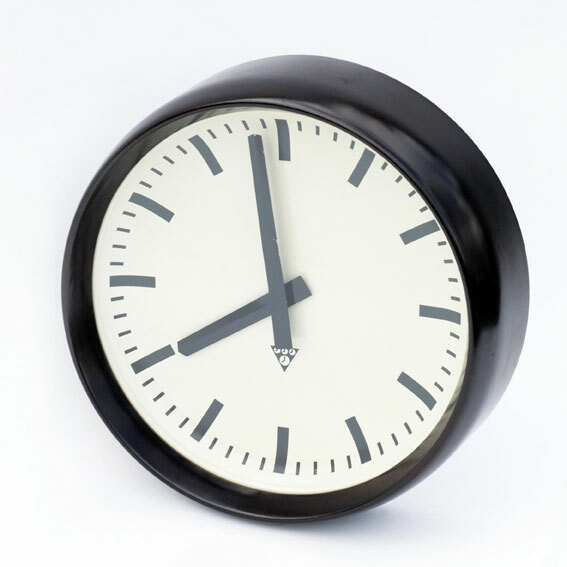 Fitted by a professional clockmaker with a new Junghans mechanism from Germany to ensure reliable operation, the clock consists of a black Bakelite circular rim with a white face featuring the typical 8 o’clock Pragotron logo and is supplied with a battery. 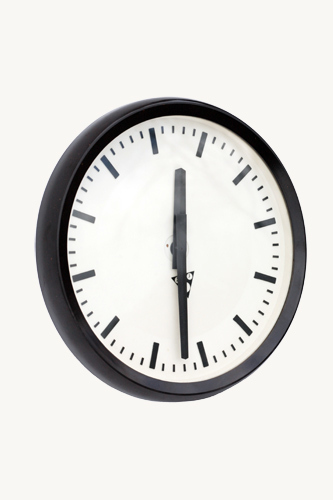 Two other similar types of clocks are also available. 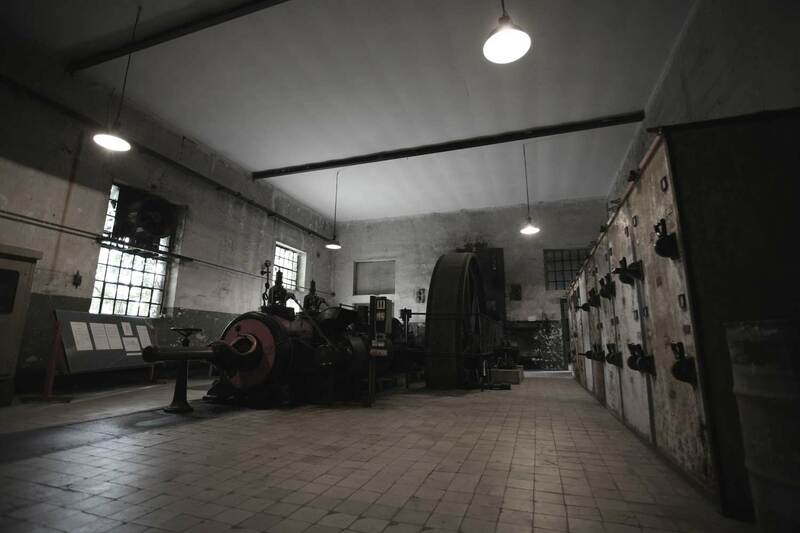 This former slave clock was made by Pragotron in Prague, at that time the capital of Czechoslovakia. The design is based on Hans Hilfiker’s acclaimed, clearly structured 1944 design for the clocks installed at railway stations in Switzerland with truncated hands and no digits. 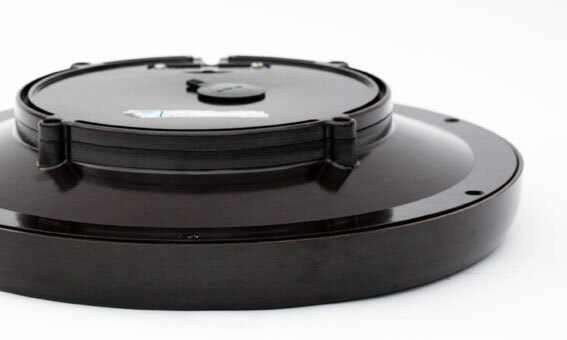 Fitted by a professional clockmaker with a new Junghans mechanism from Germany to ensure reliable operation, the clock consists of a black Bakelite circular rim with a creme face featuring the typical 8 o’clock Pragotron logo and is supplied with a battery. 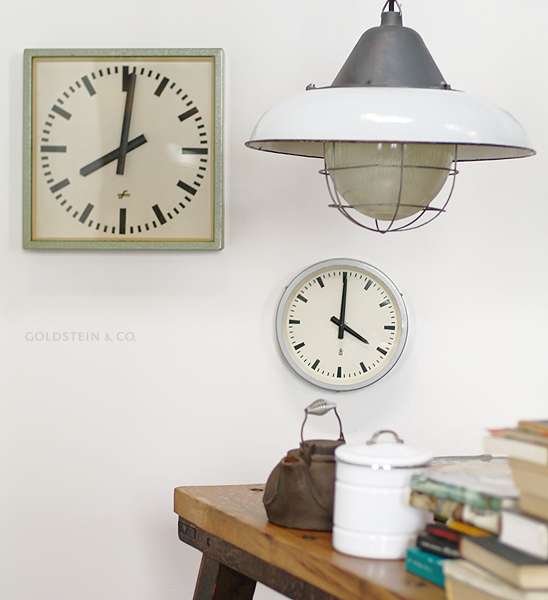 Two other similar types of clocks are also available. 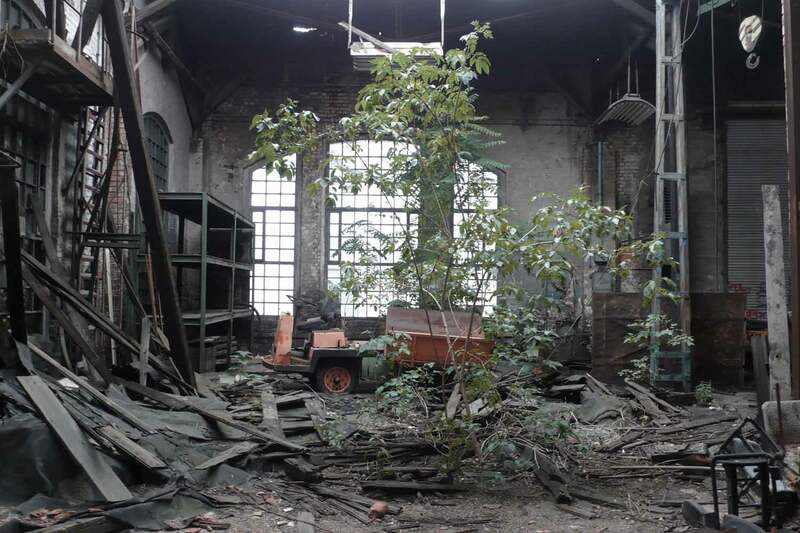 This former slave clock was made by VEB Geräte Werk Leipzig (since 1970 changed in R.F.T.). The design is based on Hans Hilfiker’s acclaimed, clearly structured 1944 design for the clocks installed at railway stations in Switzerland with truncated hands and no digits. 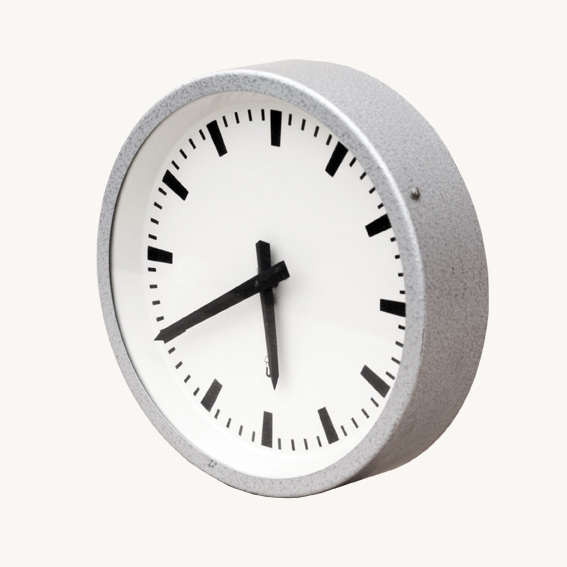 Fitted by a professional clockmaker with a new Junghans mechanism from Germany to ensure reliable operation, the clock consists of a grey hammertone finish circular rim with a white face featuring the GW logo and is supplied with a battery. 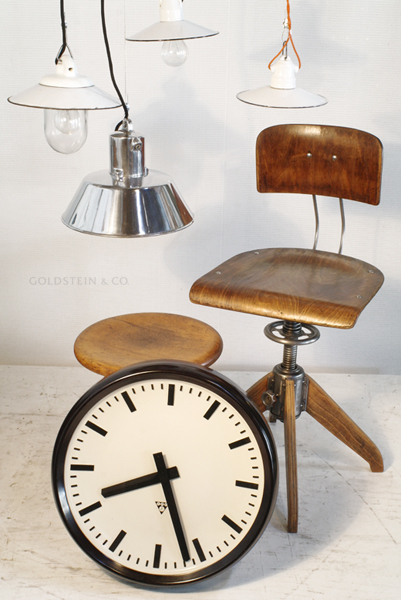 A larger similar version of this clock is also available. This former slave clock was made by Pragotron in Prague, at that time the capital of Czechoslovakia. 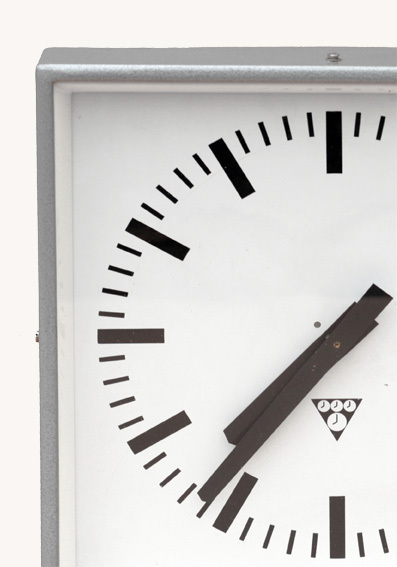 The design is based on Hans Hilfiker’s acclaimed, clearly structured 1944 design for the clocks installed at railway stations in Switzerland with truncated hands and no digits. 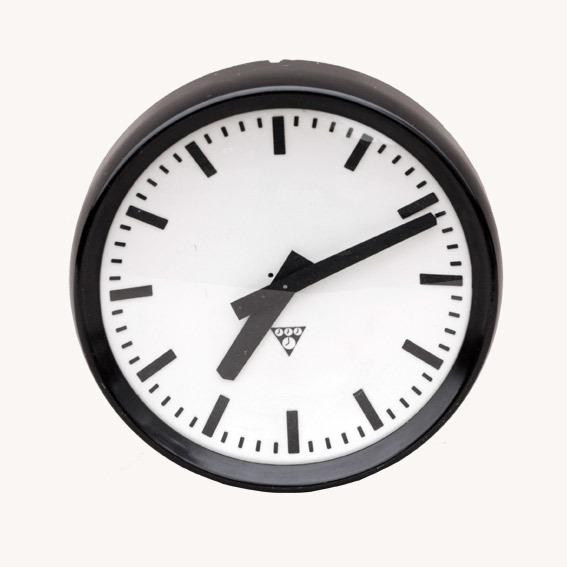 Fitted by a professional clockmaker with a new Junghans mechanism from Germany to ensure reliable operation, the clock consists of a sealed black Bakelite body with a white face featuring the typical 8 o’clock Pragotron logo and is supplied with a battery. 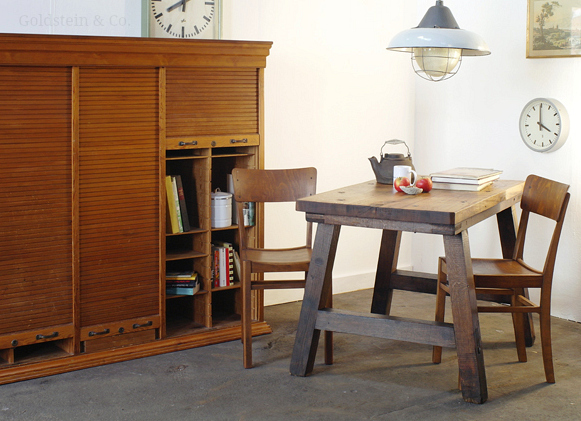 This piece of history is one of the most sought-after items we stock. 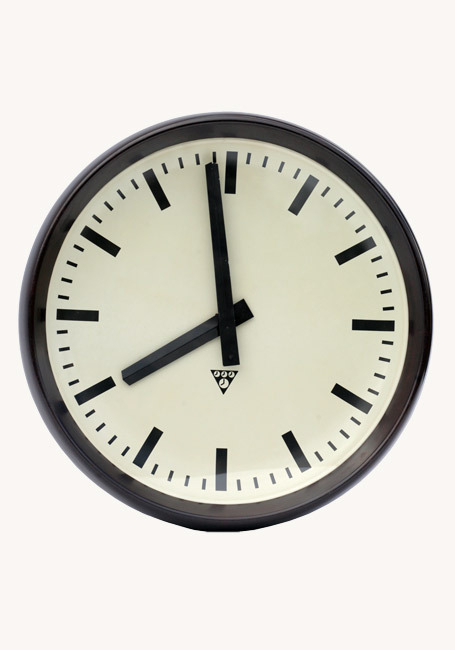 Distinguished by its typically dreary grey Eastern Bloc design, clocks like this were regular features of all public buildings and government authorities – including the notorious East Germany secret police otherwise known as the Stasi. 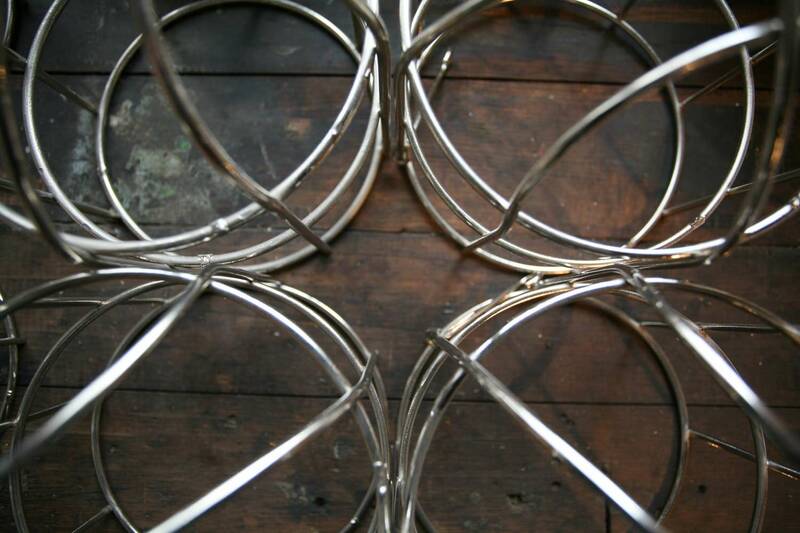 The clock face is an adaptation of Hans Hilfiker’s famous 1944 design for the Swiss railways. Fitted by a professional clockmaker with a new Germany Junghans mechanism to ensure reliable operation, the clock is shaped like a square box with a white face and a grey hammertone finish, and comes with a battery.